For the last several weeks I have woken up to the honking of geese flying overhead followed shortly after by the sound of gunfire. Hunting season is definitely on. Although the game birds of fifty years ago were primarily ducks and not geese, and the number of hunters (usually unlicenced) were farm boys of whom there were many, nothing else has really changed. The annual cycle of harvesting crops and game birds starts and finishes about the same time. This week I want to cover the smallest of our dabbling ducks, the teals. 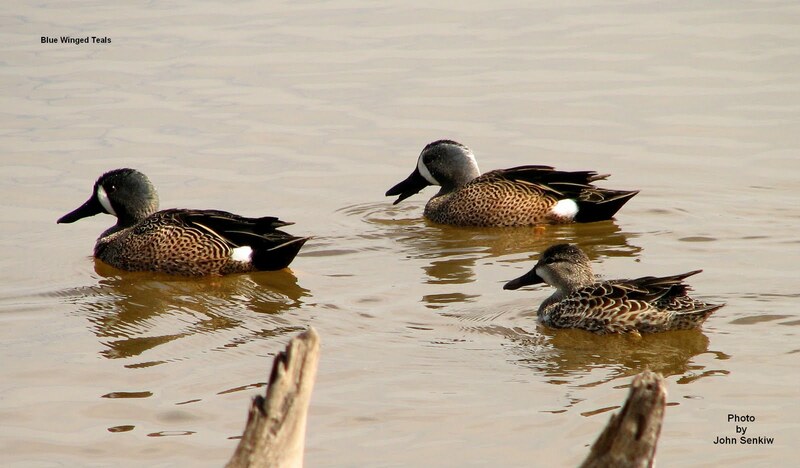 There are three teals in Canada: the Cinnamon, the Green Winged and the Blue Winged. The first occurs only in British Columbia except for the odd stray elsewhere; the latter two are very common around here. All three are closely related to the Mallard, Shoveler Widgeon and other dabblers. (Dabblers are ducks that tip up in the water when feeding). The name, teal, has no scientific meaning much like the terms dove and pigeon (see article No. 44). 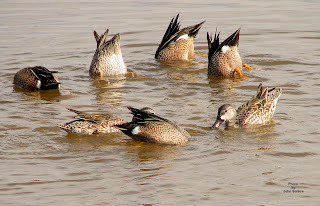 Similarly, through common usage the term, teal, refers only to the smallest members of the dabbling ducks. 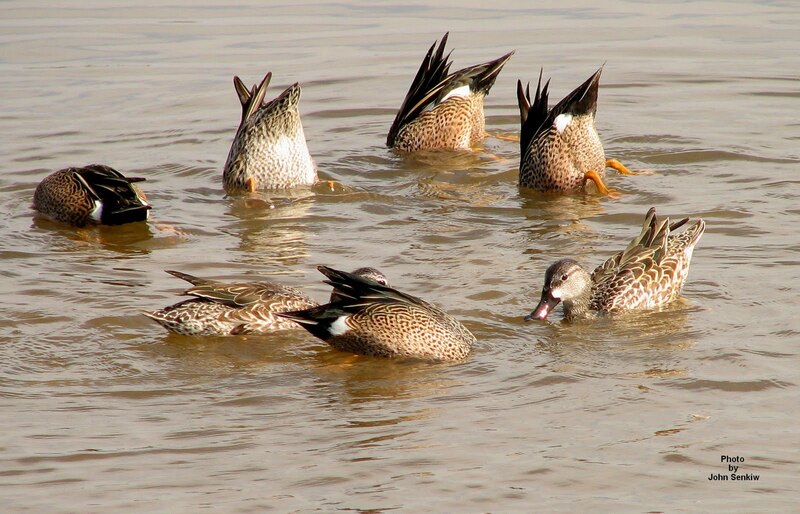 Teals do have one unique characteristic though. Except when migrating teals fly low and at high speeds making shooting them very difficult and a real challenge for hunters. Like all ducks males and females are different. The most common and the most easily identified teal is the Blue Winged. Both sexes show off their extensive and distinctive pale blue wing patches but only when in flight. In fact the name, teal blue, is named after the colour of these wing patches. The drake also has some green at the lower edge of the blue section but this should not cause any confusion with the Green Winged Teal. At rest or when swimming the wing patches are not visible, however, the most outstanding field mark is the pure white crescent on the drake's head between the eye and the bill. No other duck has a similar field mark. Another very distinctive field mark of the drake is the pure white "hip" patch located between the tips of the wings and the tail. At rest the hen is a very nondescript mottled brown bird that can best be identified by its association with the drakes. Blue Winged Teals are rather long distance migratory birds as far as ducks go ending up in the very southern part of the US and well into Mexico. Perhaps because of the long migration, the Blue Winged Teals are one of the last ducks to return in the spring and one of the first to leave in the fall. By the first week of September they have started to migrate and by October they are all gone south. This week's picture was taken at the Llano Grande State Park in Texas in February when the migration north had just started. Note the head and hip markings. Finally, a reminder that this article and all the previous articles are on my blog site: www.johnthebirder.com. Access to the site is free. On the site the pictures are in full colour and some of the older articles are updated. Also, there are more pictures on the site as it is impossible to include all the pictures in the weekly paper. For example, in this article I have included only one picture for the paper, but on the blog site there are two. The second one shows teals dabbling. As a final point the pictures on the site can be enlarged to fill the monitor for a better look. Enjoy.